NORTH EASTON, Mass. – Through the first 16 minutes, there was virtually no separation between #16 Oliver Ames and #17 Plymouth North. But through the final two quarters, the Tigers turned a tie game into a double-digit lead and picked up a 69-50 win over the Eagles. OA surrendered 18 points in the opening quarter but the defense improved in each quarter. The Tigers limited Plymouth North to 13 points in the second quarter, 11 points in the third quarter and just eight points in the final quarter. Ward, a 6’6 senior for the Eagles, had nearly half of the team’s points in the first half (15) but Cardoza and OA limited him to just five points in the second half. The majority of the separation came in the third quarter. With a two point advantage (37-35), OA closed out the remaining five and a half minutes with a 18-7 run. Senior Tim Kelley got the run going while Carter Evin and Shawn Cardoza each converted a field goal in the paint and Dylan Mahoney drained a three. Mahoney added a pair of free throws and a strong take to the rim and sophomore Jack Spillane came off the bench to drain a corner three in the final seconds to put OA up 55-42 at the end of the quarter. Mahoney and Evin opened the fourth quarter with back to back baskets to extend the lead to 17. A quick spurt from the Eagles cut it to 12 but that would be the closest they would get. A two minute scoreless stretch kept OA’s lead at 14 and when Plymouth North finally found the bucket, junior Nick Welch answered for OA. The Tigers didn’t allow Plymouth North to score over the final three minutes of play to seal the win. While OA had a comfortable lead for the majority of the second half, the advantage might have been bigger if the Tigers had converted at a higher rate from the free throw line. OA went 0/8 to start the game and finished 5/16. Evin finished with a team-high 19 points along with four rebounds, Mahoney scored 17 points and had seven rebounds and Cardoza had eight points to go along with 14 rebounds and a solid defensive performance. Mahoney had 11 of his 17 points coming in the second half (including nine in the vital third quarter). 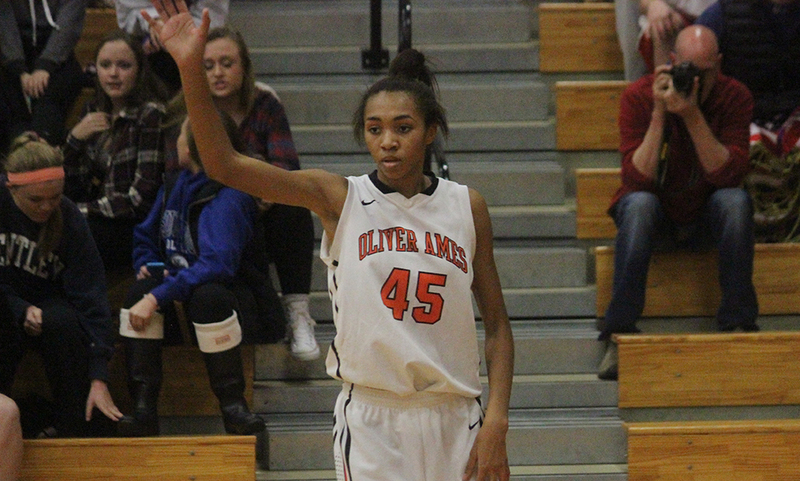 Oliver Ames finished with a monstrous 54-30 advantage on the glass. Connor Maroney had nine rebounds along with six assists, Tim Kelley had seven points and five rebounds and Nick Welch had seven assists and four rebounds. The Tigers (11-10) advance to the First Round on the MIAA D2 South bracket. Oliver Ames boys basketball will travel to #1 Bishop Feehan in a rematch of last year’s D2 South final. The game will tip off at 6:30 on Wednesday, March 2nd. STOUGHTON, Mass. – It was win or go home for the Oliver Ames boys basketball team on Monday night. 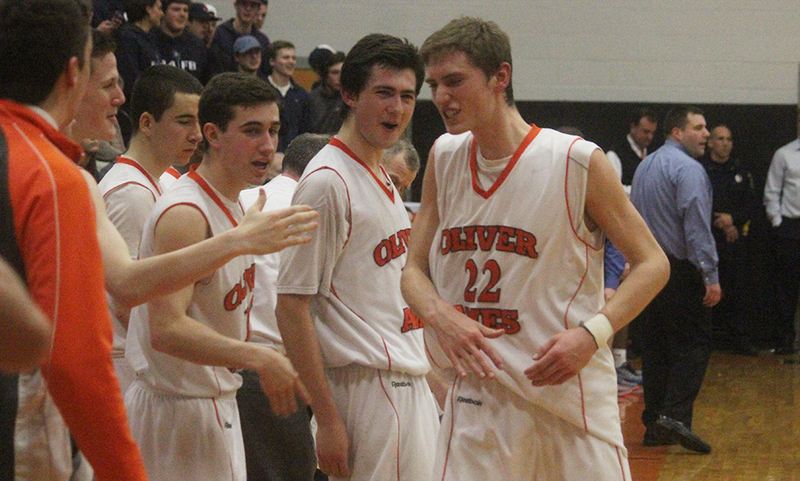 Paced by a career-high 28 points from junior Carter Evin and two 20-plus point quarters, Oliver Ames notched a 74-55 win over Stoughton and punched its ticket to the postseason. With the win, the Tigers extended it to 13 straight playoff appearances. Stoughton rallied to take a lead in the early the second quarter via an 11-4 run but the Tigers dominated the final five minutes. OA scored 21 points the rest of the way with six guys contributing to the run. Evin scored six in the stretch with Nick Welch and Dylan Mahoney each adding five and Shawn Cardoza, Tim Kelley and Connor Maroney each chipping in. OA took a 42-33 lead in into the break. The third quarter was better defensively for both sides with OA holding a slight edge, 11-9. A pair of threes from Jared Costa-Haywood brought the Black Knights within seven but OA answered with a free throw from Evin and a corner three from Kelley to push the lead back to double-digits. The Tigers closed the door early in the fourth quarter. Nick Welch drained a three to open the quarter, Evin secured an offensive rebound and putback and then pulled up for a corner three and Mahoney’s layup capped a 10-2 to open the first two minutes of the final quarter. “They don’t want to go home,” Byron said. “They’re a close group, they like playing with each other. They sincerely like each other. You could sense that they weren’t in any hurry to get out of here. Midway through the final quarter the Tigers built a 20 point lead and were able to pull their starters with a couple minutes to play in the game. “We’re a streaky team and sometimes those streaks are good and sometimes they’re bad,” Stoughton head coach John Gallivan said. “When we looked at the shot chart at halftime, they were getting whatever they wanted in the paint. We just didn’t defend. The goal was the make it hard for them to score and we didn’t. OA has absolutely come a long way in terms of their offense this season but to give up 42 points in the first half is very disillusioning. The kids played better defense in the third quarter but we need to combine that with scoring and we just didn’t. Despite a .500 record, the Tigers have been one of the top defensive teams in the league and entered Monday’s contest allowing 54.9 points per game, third best in the Hockomock. Beyond allowing 20 points in the second quarter, OA limited Stoughton to 13 in the first and fourth and nine in the third quarter. Evin led all scorers with 28 points, completing the double-double with 10 rebounds. Mahoney added 15 points, Welch had 11 points and Kelley added 10 points. 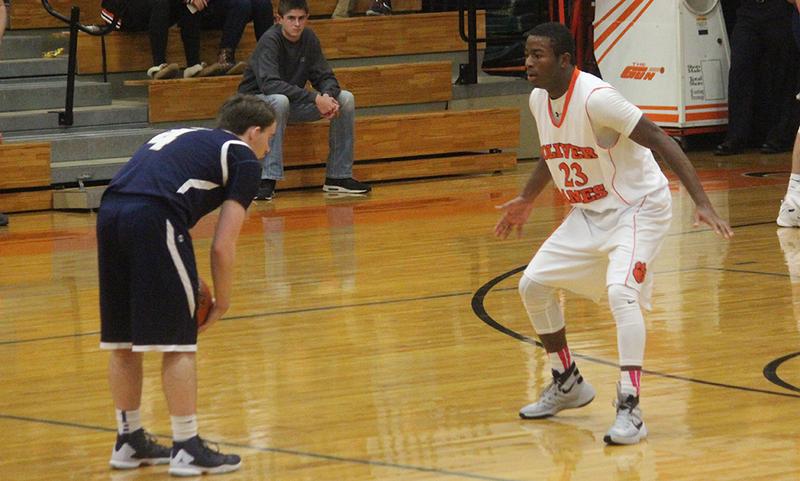 Costa-Haywood led the Black Knights with 17 points, Cam Gomes had 12 points and Cam Andrews chipped in with 10 points. Senior captain Nick Quattrucci hauled in seven rebounds. Oliver Ames boys basketball finishes the regular season at 10-10 and will await seeding in the MIAA D2 South tournament, due out on Friday. Stoughton wraps up its season at 7-13. North Attleboro, 69 @ Attleboro, 63 – Final – Brent Doherty and Ridge Olsen scored 20 points for the Rocketeers in a close win over rival Attleboro. Junior Hacmoni Cuevas had seven points, including a big three in the fourth quarter. Attleboro junior Jake Dunkley scored a career-high 31 points, also the highest scoring output by a Hockomock player this season. Andrew Milliken chipped in with 12 points for the Bombardiers. Mansfield, 66 @ Taunton, 58 – Final – Mansfield junior Christian Weber had a team-high 12 points and added six rebounds, Matt Ehrlich had 10 points, four rebounds and four assists, Tyler Boulter had 10 points, Sam Goldberg had nine points, eight rebounds and four assists and Phil Vigeant added nine points. Taunton’s Carlos Borrero netted a career-high 17 points while Quan Roberson and Jose Mercado each had 15 points for the Tigers. Oliver Ames, 61 @ Sharon, 64 – Final – Sharon missed a pair of free throws late but Oliver Ames shot from their own half missed the mark and the Eagles held on. 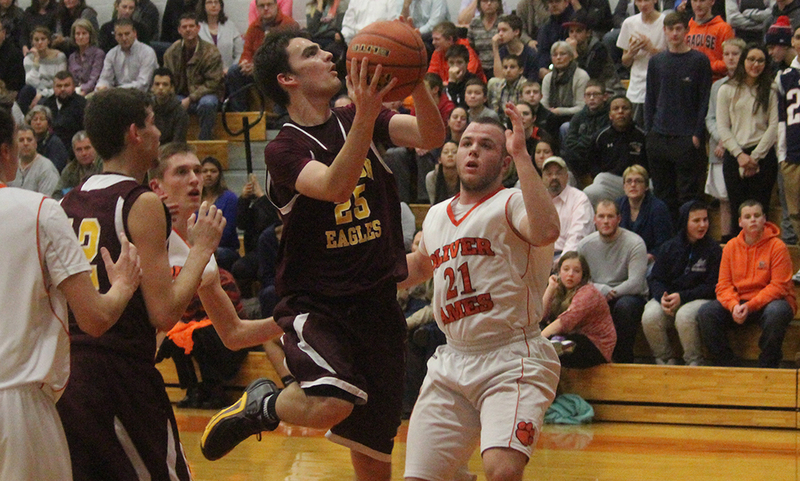 Andrew Filipkowski was one of 10 Sharon players to score, leading the team with 17 points. OA’s Carter Evin had a game-high 20 points, Shawn Cardoza added a career-high 18 points and Tim Kelley netted 11 points. Mansfield, 72 @ Taunton, 38 – Final – Sophomore Meg Hill had a double-double with a team-high 14 points and 11 rebounds while Jackie Carchedi added 13 points and Jen Peel had 10 points and eight assists. Taunton’s Lilly Patnaude led the Tigers with 10 points. North Attleboro, 39 @ Attleboro, 52 – Final – Sarah Deyo notched her first career triple-double, scoring 15 points, hauling in 12 rebounds and recording 10 blocks. Oliver Ames, 63 @ Sharon, 29 – Final – Sharon held a two point lead (13-11) after the first quarter but Oliver Ames’ big second quarter helped take the Tigers take a 14 point lead by halftime. Kayla Raymond had a team-high 18 points and Francesca Calabraro had a double-double with 16 points and 10 steals. Stoughton, 4 @ Attleboro, 1 – Final – Mark Sheehan scored a pair of goals while Nick Hardy and Sean Doherty each scored once for the Black Knights. Sam Larkin scored Attleboro’s goal off a rebound off a shot from Cam Littig. Franklin, 3 vs. Newburyport, 1 – Final – Sophomore Jeremy Miller netted a hat trick to guide Franklin to a big non-league win. MIWCA D1 Dual Tournament (Franklin) – Franklin placed fifth overall. The Panthers beat BC High (38-28) but lost to St. John’s Prep (41-21). Franklin finished the meet with wins over Plymouth South (40-27) and Framingham (34-26). MIWCA D2 Dual Meet Tournament (Milford, North Attleboro, Oliver Ames) – North Attleboro continued its very strong season by winning the D2 Dual Meet title. The Rocketeers beat Keefe Tech (68-6), Winchester (40-27) and Nashoba (51-21) to reach the finals. 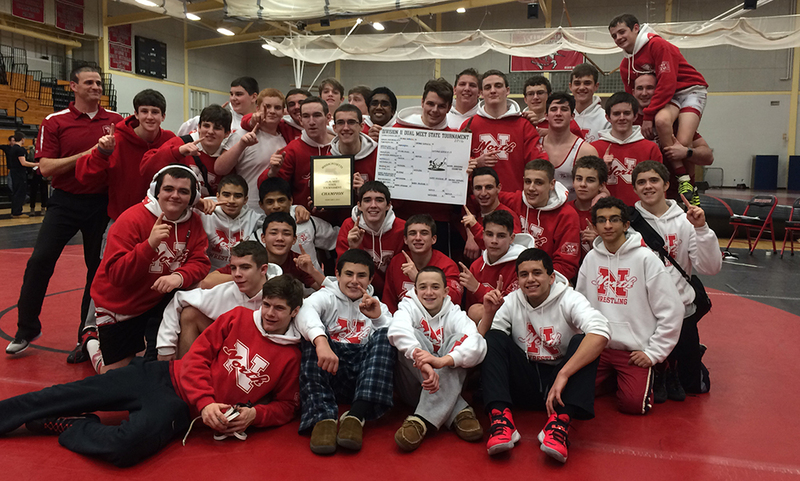 In the finals, North Attleboro took down Central Catholic, 39-22, to claim the title. OA was seeded 6th and opened with a win over Dracut (52-12) but suffered a loss to #3 Natick (60-18). Casey Bellevue went 2-0 on the day with a pair of pins and Luke Cullen also went 2-0. OA finished the season with a 20-8 record, a program record for both wins and least losses. Scituate Quad (Canton) – Canton beat host Scituate (39-29) but lost to Hingham (59-18) and Walpole (47-30). Stoughton Quad (Sharon, Stoughton) – Sharon had wins over Silver Lake (40-25), Southeastern (58-6) and Duxbury (40-34) and tied with Bridgewater-Raynham (34-34). Girls Hockomock League Championships, 9:00AM (@ Milford) – Click here for complete results. Hockomock League Championships (@ Metro South) – Click here for complete results. NORTH EASTON, Mass. – Rivals Oliver Ames and Sharon settled for a split in a doubleheader on Friday night, with the OA girls earned a big win and the Sharon boys holding on for a key Davenport title win. The second half of the double header featured Don Byron’s Tigers, coming off their third straight win, and first-year head coach Andrew Ferguson’s Eagles, which was upset in overtime on Monday night. Based on the momentum of the teams coming in, it was fitting that Oliver Ames to an 11-2 lead in the first six minutes but by halftime, the Eagles had settled in and earned a lead they wouldn’t relinquish in a 60-51 win. OA senior Tim Kelley scored eight points while junior Nick Welch hit a three to give the hosts the big lead early on but over the final two minutes, Sharon closed the gap with six points from Andrew Filipkowski and two from Ricardo Ripley to cut the deficit to four (14-10) at the end of the quarter. Matt Lowerre’s take to the rim tied the game at 17-17 and then his three pointer gave Sharon its first lead (20-19). OA answered with a Mike Graziano three but points from Devon Mann, Tyler Smith and Ripley put Sharon ahead for good. Smith hit an open three and Ripley hit a pair of free throws to give Sharon a 30-24 lead going into halftime. The lead stayed around six or seven points for the until five minutes were gone in the third quarter when Mitchell Sirota converted a put back and Filipkowski drove for two to make it 40-30. Filipkowski then drained a three to give the Eagles their largest lead (12) at 43-31. Two free throws from each Connor Moroney and Kelley were able to keep OA within striking distance at 43-35 going into the final quarter. The Eagles had the lead at 11 three separate times in the fourth quarter and after two free throws from Sirota were up as much as 12 again (55-43), but OA continued to hang around. Two free throws from Carter Evin and a bucket underneath from Graziano made it an eight point game and with less than a minute to go, Graziano drained a three to cut it to seven, but Sharon was able to hit their free throws and hold off any late charges from OA for the win. Ripley and Smith both finished with 12 points and a pair of rebounds, Filipkowski had 11 points, Sirota had seven points and four rebounds, and Banks had six points and 10 rebounds. For Oliver Ames, Kelley had 14 points, Dylan Mahoney and Graziano each had 10 points and Shawn Cardoza had 11 rebounds to go with three points. Sharon (4-3, 3-2) will look to make it two in a row when they travel to King Philip (0-6, 0-5) on Tuesday while Oliver Ames will look to get back in the win column when they travel to Mansfield (5-1, 4-1) the same night. Right from the start, the Lady Tigers were relentless with their pressure, using a full court press and athleticism to force turnover after turnover. That defense led to offense for Oliver Ames, which led to a a double-digit lead by halftime and a big 62-30 win over Sharon to improve to 7-0. The Tigers set the tone on the boards early, using an offensive rebound to get their first basket and then raced continued on for a 12-0 run. OA made it tough for Sharon every single trip up court and then quickly converted on the other end with Kayla Raymond, Kaitlyn McCarthy, Francesca Calabraro and Niyera Mitchell all contributing to the early run. A 14-4 lead after the first quarter quickly turned into a 15 point advantage when Hannah Carroll drained a three then Calabraro followed up with a jumper. Sharon’s Alyssa Piazza (team-high 10 points) scored three straight for the Eagles but baskets from Kayla Raymond, Samantha Bamford and McCarthy pushed the Tigers’ lead to 25-7. By halftime, Oliver Ames was up 29-12. The Tigers had their best scoring quarter of the game by scoring 17 points in the third quarter. OA shot 8/15 from the field in the quarter with five different players scoring. Calabraro had five, Bamford and Mitchell each had four and Raymond and McCarthy each hit field goals. One big reason for the win was how much OA dominated the rebounding battle. The Tigers were able to pull down 23 of their 35 rebounds in the first half to help created the double-digit advantage. Junior Niyera Mitchell scored a career-high 16 points and pulled in 13 rebounds to pace Oliver Ames while Kaitlyn McCarthy had 13 points and three assists, Francesca Calabraro had 11 points and four rebounds and Kayla Raymond had six points and seven rebounds. Oliver Ames (7-0, 5-0) will host Mansfield (7-2, 5-0) in a battle of league unbeatens on Tuesday at 6:30. Sharon (3-4, 1-4) will look to get back in the win column when they host King Philip (1-6, 0-5) on the same night at the same time. NORTH EASTON, Mass. – What’s one of the best remedies for a struggling offense? As Oliver Ames tries to work the kinks out on offense, it relied on its defense to deliver a 39-25 win over Archbishop Williams in the first round of the Val Muscato Holiday Tournament. The Tigers held Archies to single digits in every single quarter, helped force 28 turnovers and never trailed from the second quarter on. Turnovers and a 1/5 start from the floor six minutes into the game would make one think the Tigers would be in a big hole. But because of strong defense, OA was down just 6-2. A bucket from junior Carter Evin and two free throws from junior Dylan Mahoney tied the game with a minute to play in the first. A three from Tim Kelley put the Tigers ahead 9-6 at the end of the quarter. 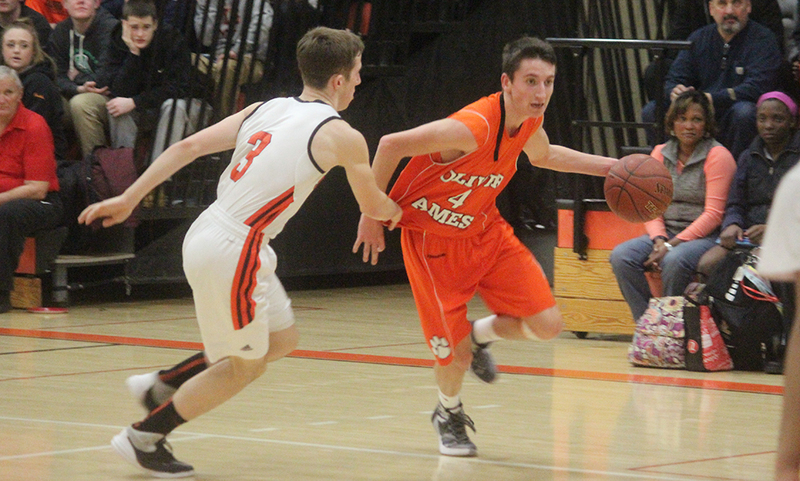 OA’s defense continued to clamp down in the second quarter, allowing just four points in the game’s second eight minutes. A putback from junior Nick Welch got the Tigers off to a good start and Mike Graziano’s three pointer with just under six to play made it 14-11. More misses and turnovers from Archies stalled their offense and OA extended the lead with a bucket from Shawn Cardoza off a nice pump fake. Up 18-10 to start the second half, Oliver Ames had its best offensive quarter in the third. Archies cut the deficit to three but OA responded with a 9-2 run, capped with a Graziano bucket at the basket off a turnover to make it 27-17. With an 11 point lead to start the fourth quarter, the Tigers held onto it each time Archies tried to get back into it. OA finished the game with an 8-3 run over the final three minutes of the game with points from Welch, Evin, Connor Maroney and Jordan McGrath. The Tigers won the rebound battle 37-22. Evin finished with a game-high nine points and added five rebounds, Cardoza had seven points and nine rebounds, Graziano had seven points and Maroney had 11 rebounds to along with three points. Oliver Ames (2-2) will play in the finals of the Muscato Holiday Tournament against Falmouth on Wednesday at 7:30.